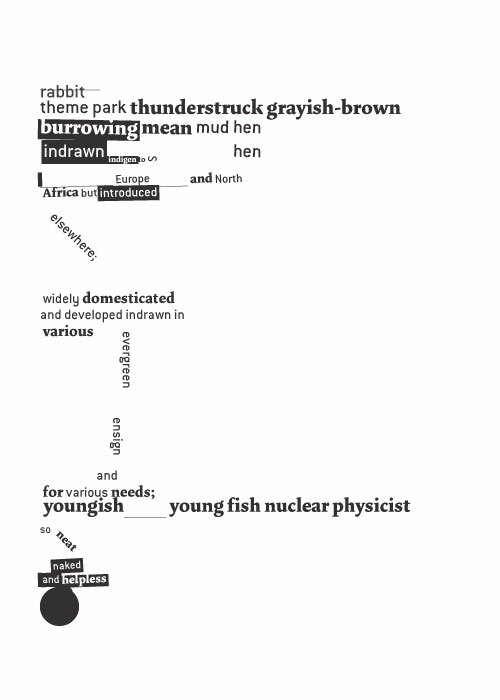 Flowerewolf builds on WordNet to create experimental poetry on any possible subject. Flowerewolf (the program came up with its own name, which is an incorporation of two words and even a palindrome) can handle basic rules of poetry, like alliteration, consonation, eloquent (read: stiff upper-lip) speech, couplets, verse. Flowerewolf even has his own visual style, not unlike Paul Van Ostaijen. You'll also need the en library. There's also a widget with a small part of the Flowerewolf-code made available (download here: flowerewolf.wdgt.zip). Cool! Now you can generate names like Flowerewolf, Computerus and Deathletics for your software (or your pets) as well! Created by Tom De Smedt.